Macerated strawberries are a very simple dessert component I learned during a brief apprenticeship as an assistant pastry chef at a local restaurant. The owner had tried to convince me that culinary school was a waste of money and that I could learn everything I needed to know by starting at the bottom rung of his kitchen and working my way up. While this may be true for restaurants whose style of food you appreciate and whose technique you hope to emulate, I’m not convinced the apprentice track applies to a local diner. Still, the experience provided an invaluable glimpse into the restaurant industry. Unfortunately, working at a stressful job, 50 – 60 hours a week, at the time and trying to deal with the physically grueling restaurant work on the weekends proved too much for me. After a few months, I thanked the folks for the opportunity and reclaimed my weekends spent cooking for friends and family. One of the techniques I picked up from the pastry chef during my time there is how to macerate strawberries. Macerating is the process of softening or breaking down a food with a liquid (usually something acidic). It’s a simple process, but so versatile. I have found a multitude of uses for the delicious little red treats, not to mention how much fun it is to say you’re macerating something. Dessert is an obvious application, but I also like to use mine as a sort of relish in cheese courses and as a topping for breakfast dishes. Variations on a theme are a good thing here. Experiment with different wines, vinegars and flavored liqueurs as a macerating agent. My preference is balsamic vinegar. Also try varying the citrus you use. Lemon is often my choice, but on the morning when I made these strawberries, I had just freshly squeezed some orange juice for breakfast, so that’s what got thrown into the mix. Culinary school is still on hold, for now. In the meantime, these strawberries are a great takeaway from an equally great learning experience. I hope you find them as useful and delicious as I do. Pour vinegar, sugar and citrus juice over the sliced strawberries and let sit in the refrigerator for at least two hours. Before serving freshly crack some pepper over the strawberries. Mix well to redistribute the juices and serve as desired. I can imagine how stressful it is working in a restaurant. I felt stressed when I cooked for my friends. My grandmother used to like to macerate peaches in brandy and serve them with ice cream. I never ate them because I was too young but I'm not anymore. I just may have to give this forgotten dessert a try. Thanks for the inspiration. I have never had macerated strawberries. YUM! I can't wait for strawberries to be in season in the mid-Atlantic. I've never tried macerating strawberries in balsamic vinegar before but I do love them macerated with red wine. My mom always used to combine cut up strawberries, sugar and lemon juice, and let them sit in the fridge getting all juicy and syrupy. I still love to cover my pancakes in them! The addition of the balsamic sounds awesome, and I love the idea of pairing them with a cheese plate! Sounds divine! I bet it would go really well on those perfect pancakes you posted about too! I would love to go to culinary school. Not because I necessarily want to be a "Top Chef" or anything of the like, but I just think it would be so much fun! I love the macerated strawberries I made last year. Thanks for the reminder. I did mine in Marsala and then made a sauce with a bit of the liquid, creme fraiche and sugar. I imagine the citrus angle would work beautifully, especially for breakfast. Sometimes simple is the best. Thanks for the reminder. Those certainly look delicious. I can't wait for strawberry season - I love them so much! What a great idea to have this with cheese. Great! I love strawberries! They are so fresh and sweet! I am going to have to take the plunge and try these strawberries with pepper some time! your pictures are bold and beautiful! I highly recommend culinary school - it was so much fun (yet...sooo expensive). 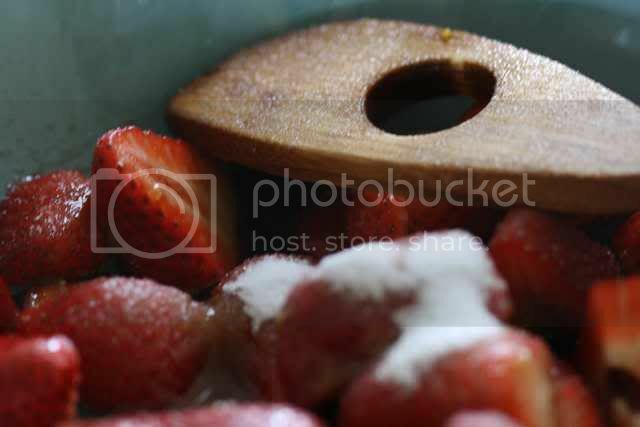 Love macerated strawberries - sometimes I add a little ice wine or rum to the mix for an added kick! Can't wait for strawberry season here - I'm totally gonna make your version. Those strawberries look so perfect and juicy! Great picture! 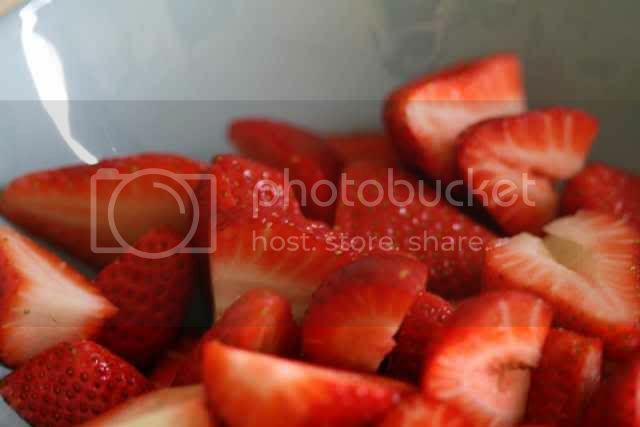 Wow, these strawberries look so beautiful. They are by far my favorite fruit. So delicious! Mmmmm - I can't wait until fresh strawberries are in season here. We love them this way. I've made this recipe several times for my strawberry shortcake, and it's ALWAYS a hit! Try flavoring your homemade whipped cream with cardamom instead of vanilla. Goes GREAT with strawberries! I too can't wait until the beautiful summer fruits are in season again. With my newly found cooking skills I'm looking for to a summer of baked bliss...Mmmm.